WERITES SSF is one of our favorite horses we have produced to date. She is out of our top mare, Orchis. Her sire, Freestyle, brings the valuable blood of Florestan, combined with one of Germany’s very top marelines. Freestyle’s dam and his aunts were the champion mares of their region in Germany four years in a row. In Werites, we combine the talents of Holland’s top dressage mareline with those of the top German dressage mareline. 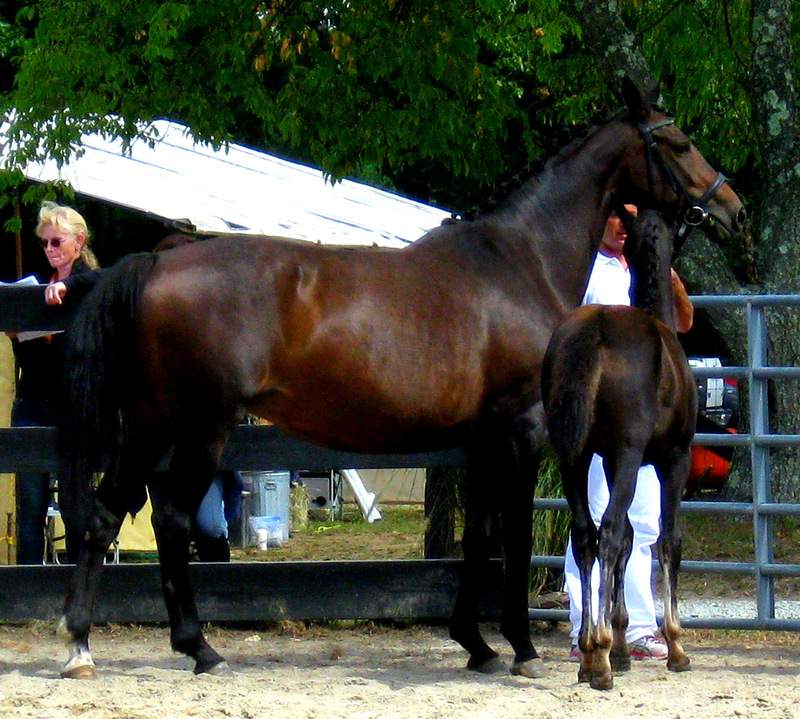 Werites wowed the jury at the New England keuring in 2006, and became top ster mare and keur eligible. She was also high score mare in North America, but because she is Register A, her scores did not count in the top five rankings. Because we believe that our best offspring should be competing in the real world, not just in keurings, Carol and I made the decision to keep Werites in training with Grand Prix rider, Jim Koford. In limited outings, she had the second highest qualifying score for the BLM Championships at first level. In her third level debut at the Palm Beach Dressage Derby, she earned her sport predicate. In the spring of 2010, Werites was being readied to compete in the Developing Horse classes, and she was showing tremendous talent schooling all of the movements for the Grand Prix. Unfortunately, she was injured in a shipping accident, which severed her right hind tendon and ruptured the left. After more than five months with the good people at New Bolton Center, Werites came home to us. She will never be sound enough for riding, but we’re hoping she will contribute greatly to our breeding program. In 2012, she produced the fancy UB-40 colt, Horatio SSF. He went on to become first premium and sold to FEI rider Jen Barrett. In 2014, she produced another outstanding UB-40 foal, Jubilantes SSF, who was also first premium, and sold to our friend and fellow Dutch breeder, Jan Downs-Barrett. Werites’s 2015 foal by UB-40 was a top filly, Karmites SSF, who sold to dressage rider Jackie Cartesio. In 2016, she had a lovely Sir Sinclair colt, Liberto SSF, who is now with Becky Kells as her next dressage prospect. And in 2017, Werites produced an ultra fancy Vitalis colt, Mahatma SSF, who was purchased by dressage rider, Lauren Kimmel. Werites is open for 2018, but we are excited about getting an early 2019 foal from Gaudi!